Wall sconce : 12"*4.25"(diameter) inches. LED Aluminum wall mount for either outdoor and indoor use. Up and Down light. 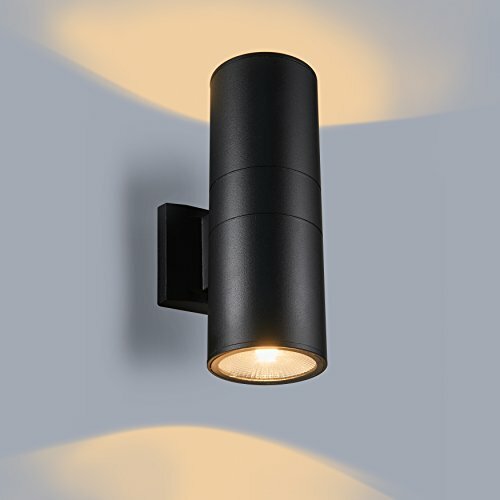 Width: 4-1/4", Depth from wall: 6-1/2", Height: 11-3/4". Metal in Textured black finish. Made of Frosted glass and aluminum with advanced casting technology which is rust-proof and yellowing proof, robust, secure, good vibration resistance. Ideal for decorating your house and garden or Corridor, Balcony, Stairs, Path, Patio, Living Room, Bedroom, Bathroom, etc. one year limited warranty against defects in materials and workmanship; UL listed.